We were so fortunate during Hurricane Sandy – the wind howled, the rain fell and the temperature dropped – but we never lost power, only had one tree branch come down and nothing blown away! Our lights flickered several times and we thought for sure that our power was about to go – but it never did. Looking at the pictures and watching the news is heartbreaking. School was closed for 3 days and then opened 2 hours late on the 4th day – thank goodness!!!! Halloween was postponed until today. So in between the storm, responding to concerned family and friends and entertaining kids I was able to start and finish a hat! Another Christmas present done, check! 1. 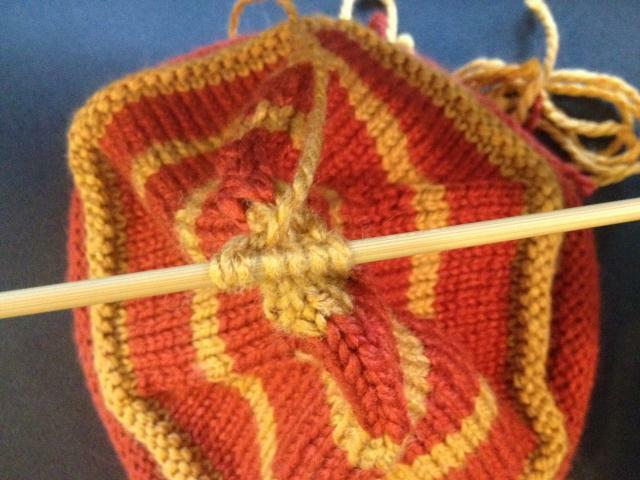 Using your circular needles cast on 102 stitches (for an adult 108 stitches and when decreasing start with knit 16, knit 2 together). 2. 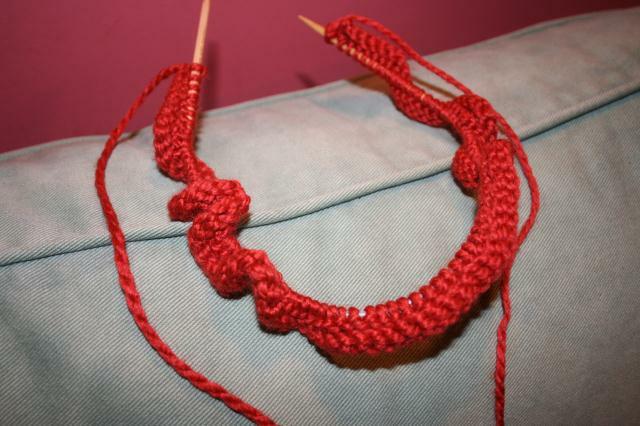 Knit 1 row as if on straight needles. 3. 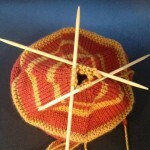 Purl 1 row as if on straight needles. 4. 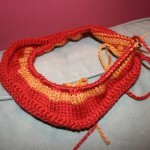 Knit 2 rows as if on straight needles. 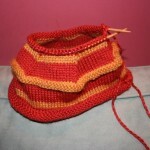 Note: the bottom of the hat when completed and all sewn together rolled. 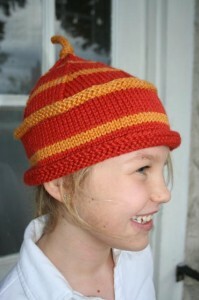 I think if I was to knit this hat again I would cast on, join in the round and knit 1 row, then purl the next 3 rows. 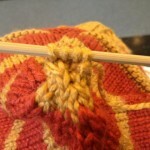 Rounds 1 – 19: Join the first and last stitch to knit in the round – making sure not to twist the stitches. 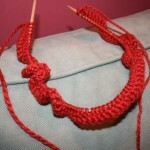 After knitting the first round, place a stitch market between the first and last stitch. If making stripes, switch colors at the beginning of a round. 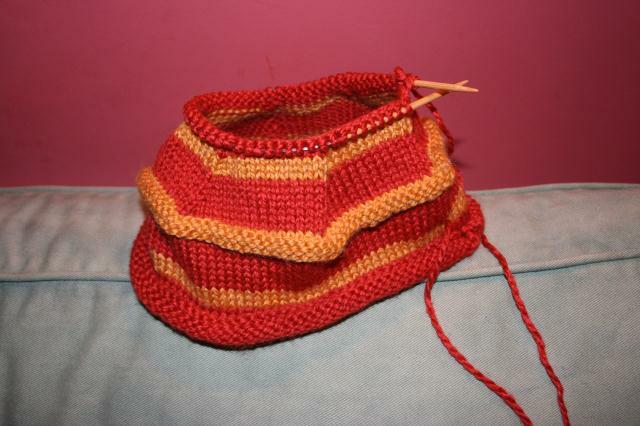 Rounds 20 – 22 purl, this will make a ridge. 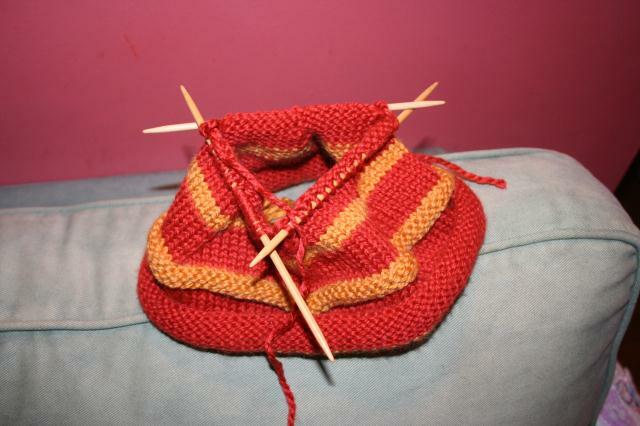 Round 24: Knit 15, K2 together, repeat to end of round. 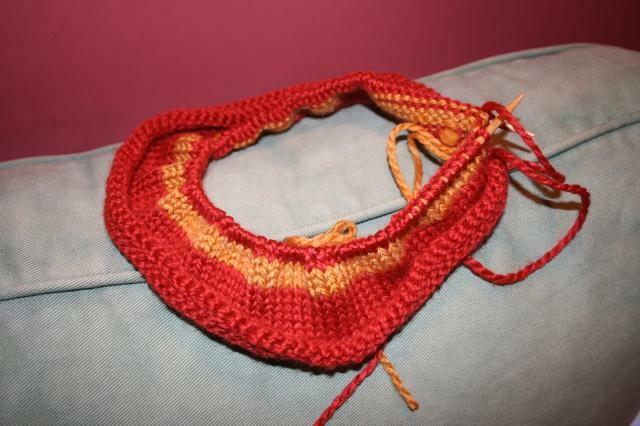 Round 26: Knit 14, K2 together, repeat to end of round. 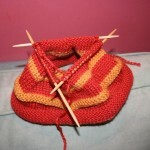 Continue to work, decreasing every other round, knitting 1 stitch less before knitting 2 together until 12 stitches remain. 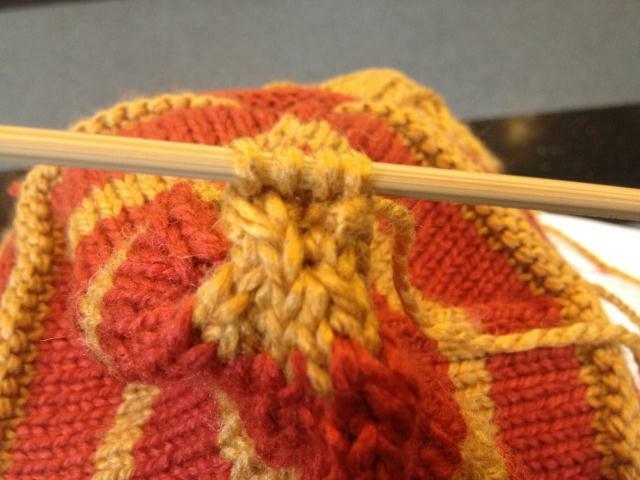 When the stitches no longer fit around the circular needles switch to double pointed needles. 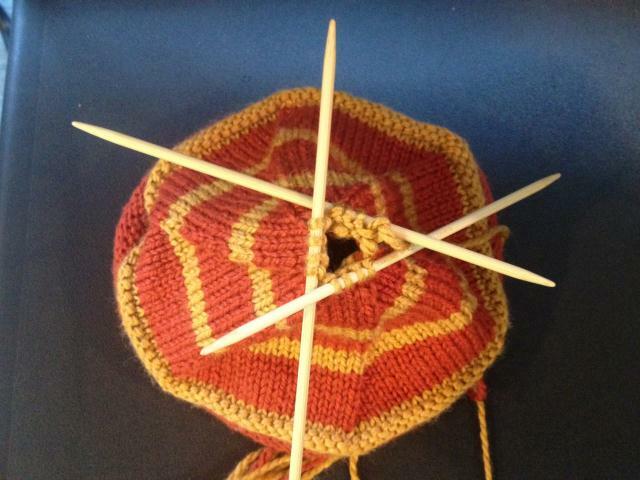 Round 1: divide the 12 stitches evenly on 3 double pointed needles. 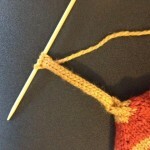 Continue decreasing by knitting 2 stitches together 6 times – you now have 6 stitches on your needles. 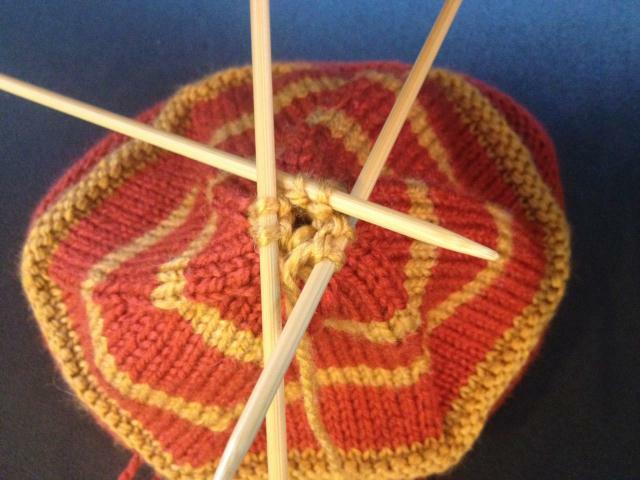 Row 3: Put all the stitches on 1 double pointed needle, making sure that the working yarn is at the end not in the middle of the needle. 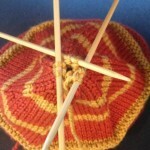 With the other double pointed needle, knit 1, knit 2 together, knit 1, knit 2 together – you have 4 stitches. Row 4 and all remaining rows: One side of the stitches is flat and one is bumpy – with the flat side of the stitches facing you knit 4 – without turning your work, slide the stitches to the end of the needle, knit the row again, wrapping the yarn over the needle to start the new row – repeat this without turning until the I-cord measures 4 inches. 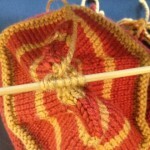 To Finish: Cut the yarn, leaving a tail about 4 inches, With the darning needle, draw the yarn through the 4 stitches. 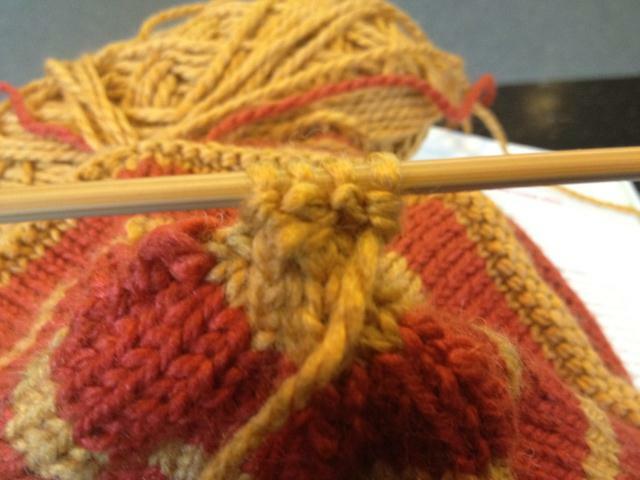 Insert the tip of the darning needle a few inches down the center of the I-cord so that most of the yarn is hidden, then pull the darning needle out the side. 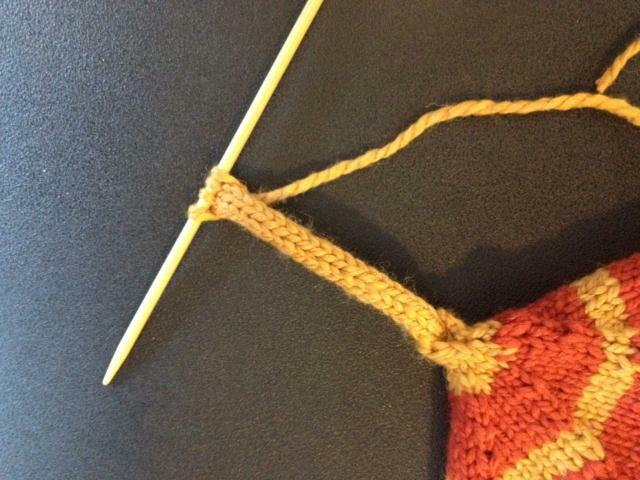 Cut the yarn. 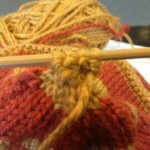 Tie the I-cord in a knot close the crown of the hat. 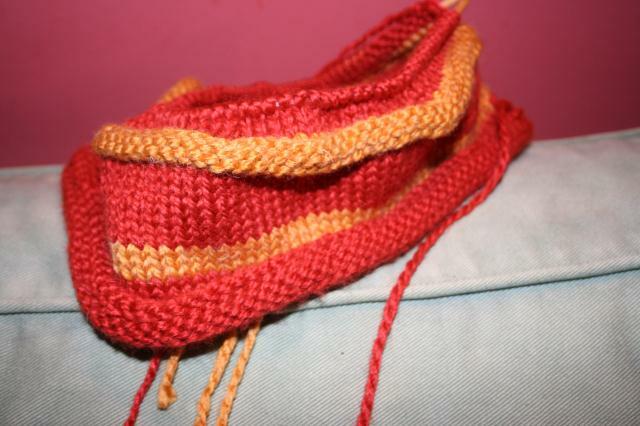 Stitch the seam at the bottom of the hat. 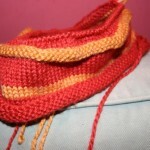 Weave in all yarn ends and cut. This entry was posted in Crafts, Knitting and tagged children's hat, knitting pattern. Bookmark the permalink. Waaaaaaaaaaaay too cute – Stella, that is! Wow, way to be productive! 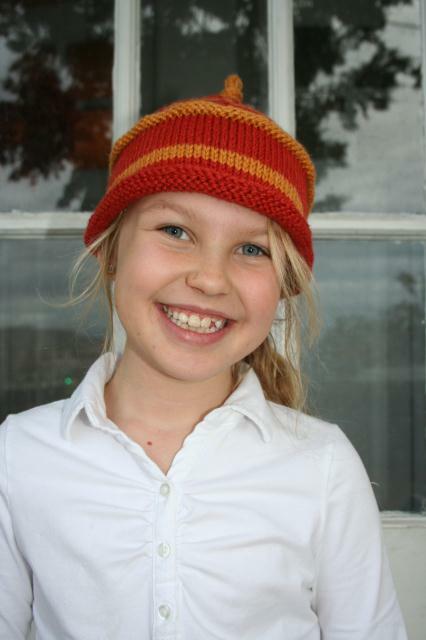 The hat is so cute & Stella is so grown up & beautiful…fun to see her growing up on your blog! Great hat! Stella sure enjoys modeling….she is such a cutie!